From those whose senses are impaired. “With the rest of the story.” Valerius replied. Bears are active out of the Wood. Upon a very strong White Oak Tree. The air! The birds! The animals! Hard to not be mesmerized. Maybe?” No one could argue with him. Work here…you could feel it in the air. “Can you speak?” Bulvar yelled to them. Built so strong. No one could speak. Forces were at work here. Voice for the men. “Are you Odin’s people? Do you hold the gates to Asgard? None answered. Then he turned to his men. Was known as Talks with His Hands. Near the Great White Oak Tree. This caught the Vikings’ attention. Themselves for battle?” Danor replied. Language broke the barriers and intrigued them. Language with these natives of the land. Innocent simple deaf boy…and Mika. And the natives also responded this way. In fact became an age of discovery. To express it and thus find solutions. Shared with his friends Danor and Tovar. Mika came to them as he usually did. To see, he had such a charming smile. And Tovar, listening and watching them. “Longer than that.” Mika said. “What do you mean?” Janson asked. Slowly replied, reluctant to explain. For families…each in their own way. Of it. And he couldn’t speak. Danor asked him half falling asleep. Me. They were all studying me. I was, as were her sisters. Said. “Patterns often repeat themselves. Together. They came together again? And over through time…” Ceres explained. “Obviously not.” Ceres frowned sadly. “It’s horrible, yes it is.” She said. “Yes, it has to stop.” She said carefully. “Do you believe it?” She asked me. To slow down.” Ceres said. “July is coming…” She said. Good right now.” She smiled softly. There’s that Groundhog Day theme again… Well… couldn’t we just keep our memories from lifetime to lifetime so we don’t make the same mistakes? The whole memory wipe thing is a major bummer. But I guess after a billion or so years a soul needs to forget… maybe…? The eternal question: bad experiences too? Nice song this week, Valiant. Why Vikings and Natives? That theme has been recurring for me since 2012. I had many dreams of a Native American “Jesus” archetype, when I moved to Maine. I think I was dreaming of, and being visited in spirit form, by the culture hero of this region called Glous’cap. The legends I have read of him, seem to blend his qualities with those of Thor. Interesting. I ran into some people of Viking descent in 2012, I had memories of sailing with them on a black timbered ship with a dragon’s head prow, over to this part of the America’s, not as a captive, but as part of the crew. I was a woman at that time, though I don’t feel I was a “warrior”, a vitki/shaman perhaps? When I met them all in 2012, I started to remember having been involved with Beowulf, somehow. (Yes, he was a real person, so was Wiglaf, and they were ALL shapeshifters/berserkers.) 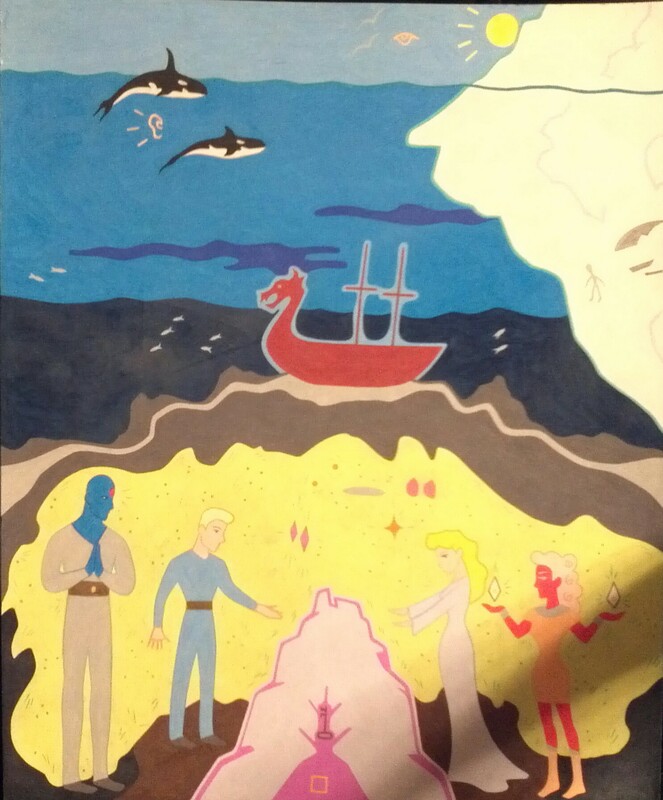 This same group of people of Viking descent, were with me during Beowulf’s time, other memories of being with the same group in South America, or somewhere in that region, and again, I was a woman. I know my path, and theirs keeps crossing, but why? I find it interesting that our paths in this lifetime crossed just before the Venus transit on June, 6, 2012. Something significant about that. Perhaps I only encounter this group of people when Venus transits occur? The next on will be in 2117. This one made me giggle…”The Black Spot”… A death sentence (to the Apostate priests/male dominated church) issued by the Return of the Divine Feminine Archetype? I wonder if the real “PIRATES” are those who gave us the “holy scripture”??? Lol! LIDA, VALIANT, AND BARB…I SURE HOPE YOU ALL SEE THIS “THE RETURN OF THOR”!!! LET’S TRY THIS AGAIN…SEE THE NUMBER 9? “WIND AGE…WOLF AGE HAS COME.”! GO VALIANT THOR…WE’VE GOT YOUR BACK BROTHER! The way stichomancy works for me, is I close my eyes with my old dictionary in my lap. My guides will reference one letter, so I open the book at approximately where I think that letter section is, with my eyes closed. Then I open the book. I may hear go 1 to 3 pages left or right, then I hear right or left page, then middle or outside (it has 2 columns) then go up higher or go down lower, and sometimes go up 1-2-3, right there. They guide my mind to point my finger, with my eyes closed, and when they say there or okay….I open my eyes to see what the word is my finger landed on. If the word’s definition is really small in size (some are just 1 or 2 lines) then my finger could actually be resting on several words at once, or on an image. Once in awhile I don’t understand the relevance of the word to the question/person, so I ask for another word, to help me make sense. Usually about 98% of the time, it’s very easy to understand the significance and meaning of the message/answer, as it relates to what I had in my mind when I was asking for a word. Often it is an extremely pointed word….right on target…which blows me away no matter how many times it happens. Like the other day, with getting *deliverer* for Valiant….writing and sharing as he does…..answered right after reading his post about him being the deliverer, Valiant Thor. Which is major synchronicity. Today, too, the words are incredible….especially Robin’s with synchronicity considering what she just barely said, above, about having Valiant Thor’s back!!! They are backing you up, Robin!!! So thank you for such amazing confirmation for me, personally, that these words are also confirmations about us, seeing more clearly the bigger picture. I don’t always share what I am given, sometimes the words are just for me, for helping me to discern. Other times I’m asking with the intent of sharing the given word/message. Today’s words are like that. I didn’t ask for every single person who posts here, but just those that I felt nudged. It filled up 2 pages worth of my notepad, so here goes! This was the first question I asked today, watching some TV shows on the end of the earth type scenarios. What is the biggest event for Earth the rest of 2017? Who does Valiant work with the most, in terms of who he’s connecting with, what is their purpose for our group? What is my connection/purpose regarding Valiant? *habitant* An inhabitant. Also habitan. One of the settlers, or their descendants, in Canada or Louisiana, of the farming class. Basically for each of the names below, I asked the same question about some of the *personalities* who shine their faces ’round here…..Who are they? Who were they? Who are they now, in regard to their role in being part of this group? Who is/was Robin? *wing back formation* American Football. A formation on the offense by which one of the backs is placed just behind or slightly beyond and to the rear of; the end. — Called also single wing back formation. Dave Jones? *dolce* [Italian. sweet, soft] Music. A very soft flute organ stop of either 8-foot or 4-foot pitch. See STOP. Suzanne? *coy* shrinking modestly; shy; or coquettishly from familiarity; usually applied to women; demure. Tauno? *mating* A pairing or a matching. Troy? *peregrinate* [L(atin) peregrinatus. past part(iciple) of peregrinari — to travel. See PILGRIM.] To travel; to journey from place to place. Bill/Valiant? *caddy* 1. One who waits about for chances to do odd jobs. 2. An attendant who carries a golf player’s clubs, etc. Ceres? *orb* (What stood out the most were definitions #4 & #5: 4. A collective whole; a world; as, an orb of witnesses. 5. A sphere surmounted by a cross, symbolizing Kingly power and justice. WOW. The feeling I was getting was Ceres gladly sharing that word with the whole family…their world a collective whole….the orb of witnesses….the watchers…symbolizing Kingly power and justice. That’s really interesting! I’ve never thought before to use a dictionary. I frequently will pick up a book and do something similar.. or with music I want to learn. A few of those are like omg, seirously?? Midsummer! haha geez. ‘Law’ is interesting to me, I’ve been deep in vocal phonic studies today and that word of all listed, I kept repeating over and over. When I just “pondered” for a minute, what’s law got to do with me… and I thought “balance” and as I looked up, out the window was a bird sitting on a baby, growing tree wings spread out, balancing.. haha. Life. Among French Canadians the term “voyageur” refers to people who transported furs by canoe, but the meaning also refers to something like a “rustic adventurer” who sees the journey as the goal rather than the destination. Peregrinus was the term used during the early Roman empire, from 30 BC to 212 AD, to denote a free provincial subject of the Empire who was not a Roman citizen. Peregrini constituted the vast majority of the Empire’s inhabitants in the 1st and 2nd centuries AD. Hi Amber. Good to hear your thoughts on those words and also how you do stichomancy with books or music you want to learn. That’s how I learned originally, with books, I still do that….once in here last summer, when I first started posting, I shared a stichomancy with the book by Ken Carey’s Return of the Bird Tribes….which turned out to be from the story of White Buffalo Calf Woman. I love her story. It was pretty cool hearing about Miracle the white buffalo calf born some years ago in Janesville, Wisconsin. Her coat turned from white to tan to brown to black, I think….kind of like symbolizing a variety….as in a rainbow or a shifting of frequency type thing maybe. Amber, on your word being *law* I did wonder about that, as I don’t get a legal lawyer type feeling regarding you! That’s awesome about it becoming more clear as you pondered and the balance aspect makes perfect sense, especially with the little baby tree bird depicting it in real life out your window! Me too, with wanting to know more about the “higher forces”. It’s good to have an understanding of the sea….cosmic law…..where do those rivers of duality reality come from? It’s a great life’s journey when you are seeking more understanding of the Source….the Forces…governors on the motor of Life. Yeah, I totally get that Amber. It drives me too, wanting to know as much as possible about the really big picture stuff, all the esoteric things the mainstream would have us ignorant of (divide and conquer). I’m on the fringe stream, not the main stream. I loved reading the gnostic texts of Nag Hammadi. I love Valiant’s stories. I just want to know as much as possible about spirit aspect of life. My husband says he wants to live a totally physical life, the afterlife, stuff of spirit….is for when you are spirit…live in and enjoy the flesh life while you’ve got it. But I care very little for the mundane, ordinary side of life….I want to ask deep questions and get deep answers….stuff that you have to reach for, to ever find it….you have to leave the path commonly trod. Which is why I love to find people like Valiant….and those here at Troy’s STC….who love delving deeper, too. Especially important at what is apparently a quite crucial juncture for humanity, a tipping point, where more will be revealed of God’s mysteries. I want to get beyond duality too, and into unity, into a universe where nobody has to be scared of being attacked, subjected, subjugated, humiliated, and otherwise tossed into hell. I want to get us into a state of being where are free to be who we really are, and love freely, live more joyfully, and witness more of the Hand of God at work. Where 1% isn’t sucking the lifeblood dry out of the other 99%, power over….I want empowerment for all….to be free to learn, love and live as they wish. Balance would be awesome, too, just so the scales of justice are free again. Hi Amber, I’ve been interested in those “templates” as well. Very cool thank you for sharing! I found this, what you just said interesting.. I shared this on FB the other day from Sun Sync Nutrition.. different but related maybe? Though it can be a pitfall to say that both things are the same thing… rather than sharing the same template… but I think he gets the idea! Oh my gosh! Barb! Love your readings…those all fit us SO WELL! “Wing Back” eh? 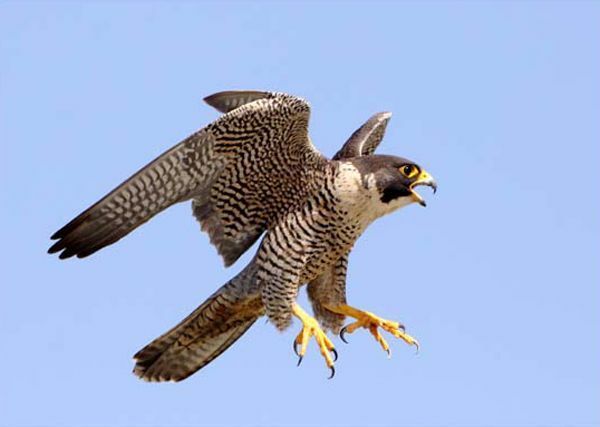 Is that why Hiawatha called me “The Girl With The Wind Beneath Her Wings”…AIR/Wind…get it? Lol! Another little chuckle here for you Barb…I have a poster above my computer on the wall “MIDSUMMER EVE” BY Edward Robert Hughes! Lol! Oh Robin, I know how happy I am that puzzle pieces are really fitting together much better now, thank you for the validation! I’m writing you a long email which may take a few days to get it all together. I love that you actually have the poster of MIDSUMMER EVE right there above your computer! LOL Aphrodite….Hermaphrodite a blending of both….equality….balance…just like a pair of wings is required for light flight. Wind Beneath Her Wings does fit. 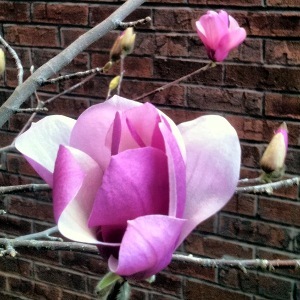 Yes, quite contrary, mostly, how does your Garden grow? Have you seen…..the Gardener? He sure wears a lot of different hats, sometimes can be a little difficult to recognize him, unless you know…..his voice. Wow….as always, I cannot thank you all enough !!! Thanks also for Robin’s reminding, I knew to consult the table of Valiant’s Ancient Prophecies….then happened to be caught by this one, as I’ve been so haunted by the SHIPS OR BOATS the last couple of months…. Duh…am I slow…Thanks for posting this pic again for us Feilla! The ship is a DRAGON HEADED SHIP! With two red crosses…the double barred Cross of Loraine? Is that a pink crystal that holds the key? Dear Sweetie, not go to sleep yet?! I’m overwhelmed by your wit & amazement !!! A plus synchronicity occurs when I read this comment ! I just popped up itself at that very same time. I might have once posted a concerned or even identical video…An echo of what Troy (Dreamwalker) just posted as above ?!!! Those are true words of wisdom….wise as an owl, definitely. Thank you for sharing that Troy. I liked it so much I saved it to a Word file for reading as often as I need a reminder of how to conduct myself! I’ll have to wait until the weekend to check out that whole site, just haven’t got enough time to devote to reading at the moment, but between you, Robin and Feilla….I am looking forward to devouring all of the fine morsels you’ve all been giving! Have an awesome day, my walker444 brother! Lida, if you are reading, I have been writing and writing and writing, days on end, for a book review for Bill’s book The Bell Tolls! Yesterday I got my email from Amazon as a buyer, asking if I’d like to write a review…..YES….I absolutely would and will do that! I’m drafting and figuring out what I want to say and how to say it. Troy’s post helped me a lot, in that regard, with the words above. I just want it to be “just right”. I really want the whole world to be drawn into a true happy state, which we ALL so sorely deserve!!!!! If we could all get that original timeline going in full swing, I’m sure we will be able to overcome those who try to overpower and subdue and suppress and oppress us. Extremely AWESOME, you all as above !!! Sorry for my very linguistic dysfunction, I cannot but just share the pictures. 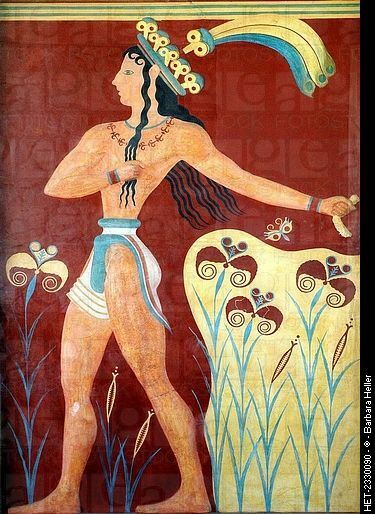 The Minoan civilization was an Aegean Bronze Age civilization on the island of Crete and other Aegean islands which flourished from about 2600 to 1100 BC. 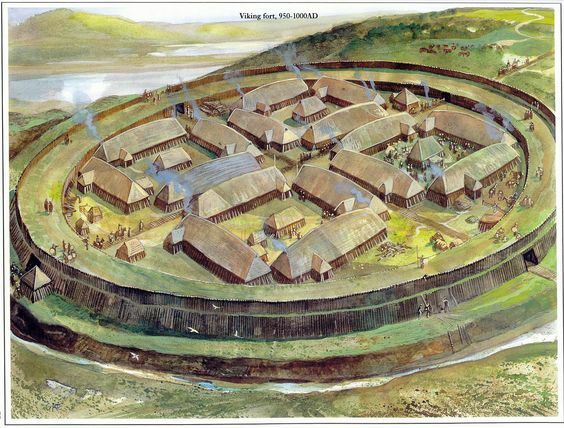 It preceded the Mycenaean civilization of Ancient Greece. The civilization was rediscovered at the beginning of the 20th century through the work of British archaeologist Arthur Evans. It has been described as the earliest of its kind in Europe, with historian Will Durant calling the Minoans “the first link in the European chain”. 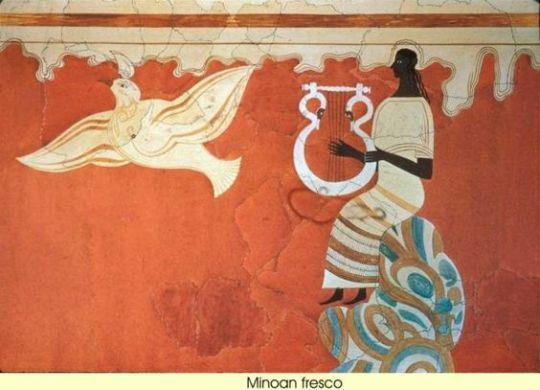 The term “Minoan”, which refers to the mythical King Minos, originally described the pottery of the period. Minos was associated in Greek mythology with the labyrinth and the Minotaur, which Evans identified with the site at Knossos (the largest Minoan site). According to Homer, Crete once had 90 cities. The Minoan period saw trade between Crete and Aegean and Mediterranean settlements, particularly the Near East. 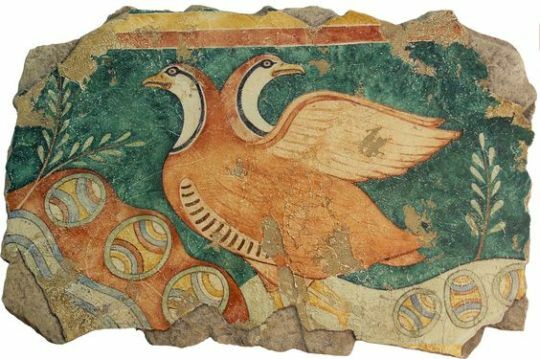 Traders and artists, the Minoan cultural influence reached beyond Crete to the Cyclades, Egypt’s Old Kingdom, copper-bearing Cyprus, Canaan and the Levantine coast, and Anatolia. Some of its best art is preserved in the city of Akrotiri on the island of Santorini, which was destroyed by the Thera eruption. Although the Minoan language and writing systems (Linear A) remain undecipherable and are subjects of academic dispute, they apparently conveyed a language entirely different from the later Greek. 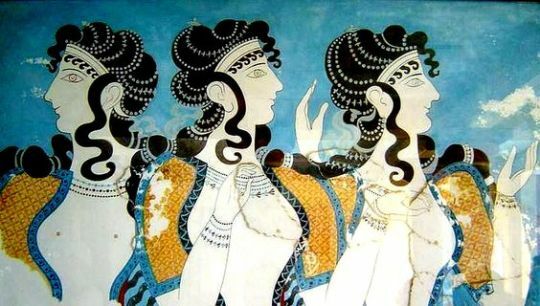 The reason for the end of the Minoan period (around 1,400 BC) is unclear; theories include Mycenaean invasions from mainland Greece and a volcanic eruption of Thera. 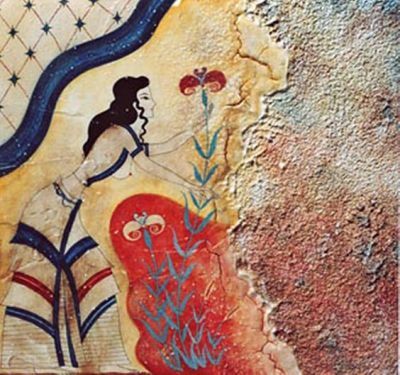 The Minoan civilization flourished in the middle Bronze Age on the Mediterranean island of Crete from ca. 2000 BCE until ca. 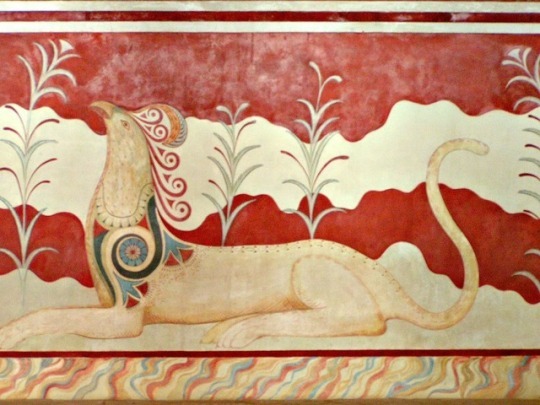 1500 BCE and, with their unique art and architecture, the Minoans made a significant contribution to the development of Western European civilization as it is known today. The four principAl Minoan palace sites were at Knossos, Phaistos, Malia and Zakros. Minoan settlements, tombs and cemeteries have been found all over Crete but the four principal palace sites (in order of size) were at Knossos, Phaistos, Malia and Zakros. 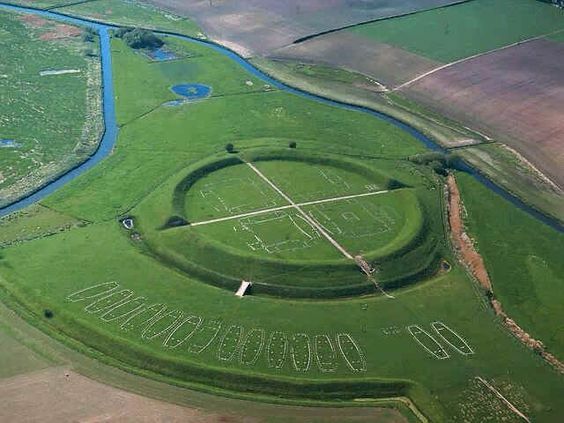 At each of these sites, large, complex palace structures of two or three stories and covering several thousand square metres seem to have acted as local administrative, trade, religious and possibly political centres. The relationship between the palaces and the power structure within them or over the island as a whole is not clear due to a lack of archaeological and literary evidence. 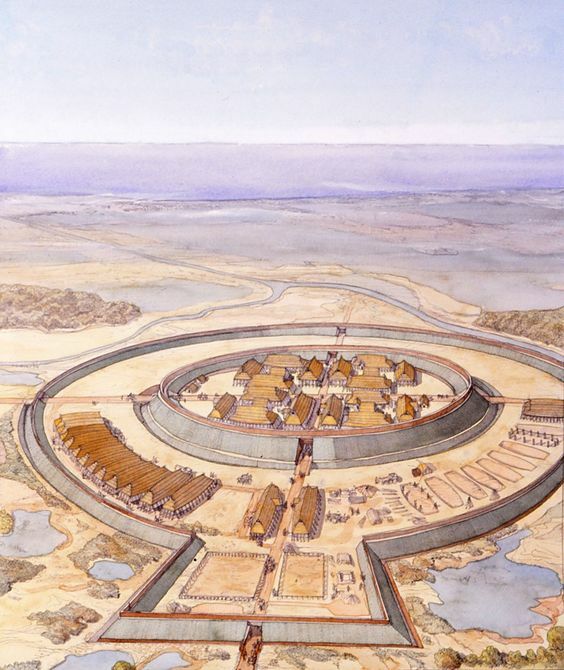 It is clear, however, that the palaces exerted some kind of localised control, in particular, in the gathering and storage of materials – wine, oil, grain, precious metals and ceramics. The absence of fortifications in the settlements suggests a relatively peaceful co-existence between the different communities. However, the presence of weapons such as swords, daggers and arrow-heads and defensive equipment such as armour and helmets would also suggest that peace may not always have been enjoyed. The palaces themselves covered two periods: The first were constructed around 2000 BC and following destructive earthquakes and fires, re-built again ca. 1700 BCE. These second palaces survived until their final destruction between 1500 BCE and 1450 BCE, once again by either earthquake, fire, or possibly invasion (or a combination of all three). The palaces were well-appointed, monumental structures with large courts, colonnades, staircases, religious crypts, light-wells, drainage systems, extensive storage magazines and even ‘theatre’ areas for public spectacles. The complexity of these palaces, the sport of bull-leaping, the worship of bulls as indicated by the presence throughout of sacred bulls’ horns and depictions of double axes (or labrys) in stone and fresco may all have combined to give birth to the legend of Theseus and the labyrinth-dwelling Minotaur so popular in classical Greek mythology. The partially reconstructed wing of the palace of Knossos c. 1500 BCE. 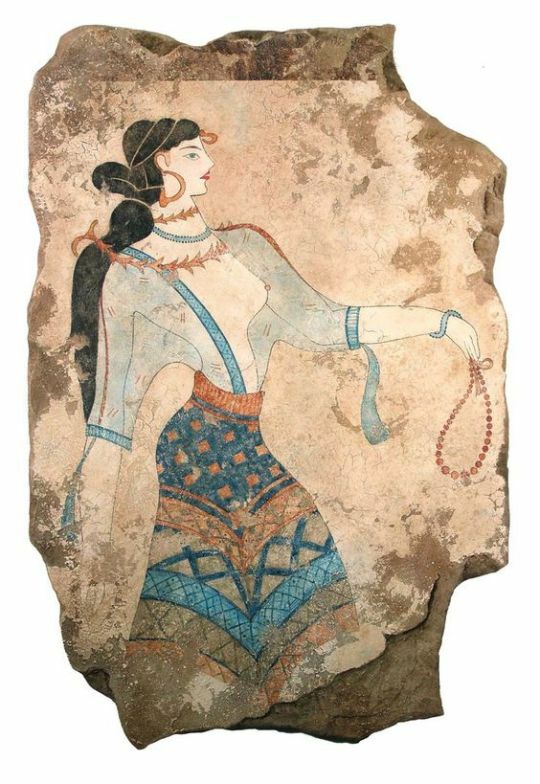 The sophistication of the Minoan culture and its trading capacity is evidenced by the presence of writing – firstly hieroglyphic and then Linear A scripts (both, as yet, undeciphered), predominantly found on various types of administrative clay tablets. 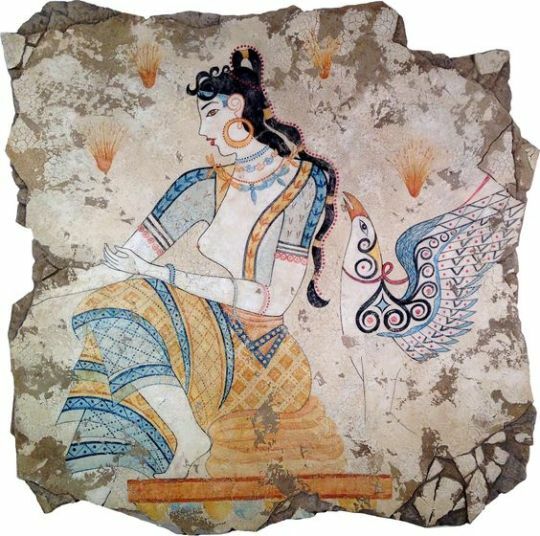 A further example of the culture’s high degree of development is the variety and quality of the art forms practised by the Minoans. Pottery finds reveal a wide range of vessels from wafer-thin cups to large storage jars (pithoi). Ceramics were initially hand-turned but then increasingly made on the potter’s wheel. In decoration, there was a progression from flowing geometric designs in Kamares ware to vibrant naturalistic depictions of flowers, plants and sea life in the later Floral and Marine styles. 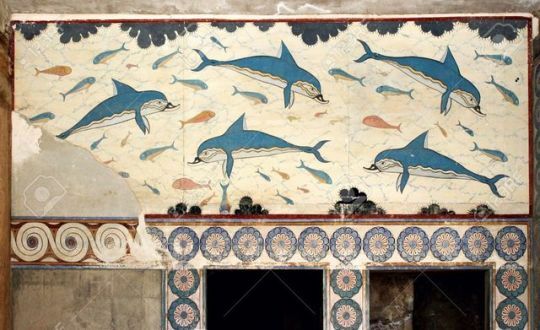 Magnificent frescoes from the walls and floors of the palaces also reveal the Minoans’ love of the sea and nature and give insights into religious, communal and funeral practices. Metal, stone, ivory and faience work also reveal a high degree of craftsmanship, examples range from fine alabaster jars to dynamic ivory sculpture in the round to minutely carved gold rings and seals. The Minoans, as a sea-faring culture, were also in contact with foreign peoples throughout the Aegean, as is evidenced by the Near East and Egyptian influences in their early art but also in later export trade, notably the exchange of pottery and foodstuffs such as oil and wine in return for precious objects and materials such as copper from Cyprus and ivory from Egypt. 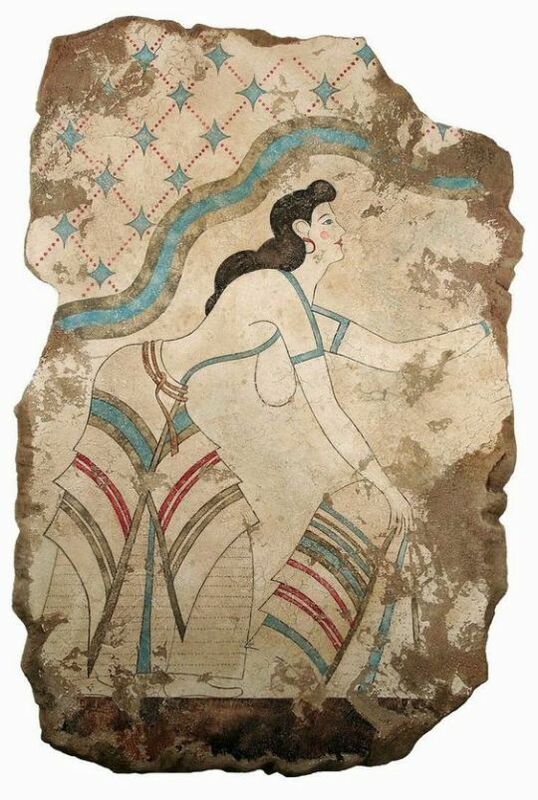 The reasons for the demise of the Minoan civilization continue to be debated. The rise of the Mycenaean civilization in the mid-2nd millennium BC on the Greek mainland and the evidence of their cultural influence on Minoan art and trade make them the most likely cause. However, other suggestions include earthquakes and volcanic activity with consequent tsunami. The eruption of Thera (the present day island of Santorini) may have been particularly significant, although, the exact date of this cataclysmic eruption is disputed and therefore its connection with the end of the Minoan period remains unclear. Wow Tribe! We are busy, busy, busy! Thanks for posting the owl video again Feilla. I was watching it and thinking of the movie and that the owls are like us…maneuvering through the unknown and the dangerous storms that blow, to get to an island of legend and find the truth! I loved the preview of your review Barb…you are such a poet! Those few lines sure had me hooked. I’m still waiting on my copy of “Higher Forces” to come in. I did put in a request for the book via my local library so…we will see. I am viewing the video link you posted now Troy. Sounds like it will be quite an eye opener.